Two weeks ago I was in the northeast corner of Minnesota wearing all my layers and drilling holes in lakes to fish through. It was good to be out in the woods breathing cold air. It was also good to be reminded that at the foundation of my fly fishing life is a childhood love for fishing of all kinds. The frozen world around me precluded fly fishing and so I felt no touch of shame when I was buying minnows or adjusting the gain on my sonar. Now I’m back in the central part of the state, in the depths of the longest and warmest February thaw that I can remember—and the last few years have been quite warm. In the back of my mind a dark shadow looms and asks if we’ll ever see our long, cold winters again and what kind of northern Minnesota my kids will grow up in. For now, the point is: the snow here is long gone, and the ice on the lakes hand-drills far too easy for comfortable walking. What’s especially stirring is the air. The smell of thawing earth rouses hibernating thoughts within me just like it rouses hibernating flora and fauna. The grass is greening and wasps are slouching out of their cubby holes and even bats have been reported. I’m sure it’s uncomfortable for those creatures, and will be more so when the cold inevitably returns for one last deep freeze. But they can’t help it. The power of spring, even an early false one, compels them. So it is for me. 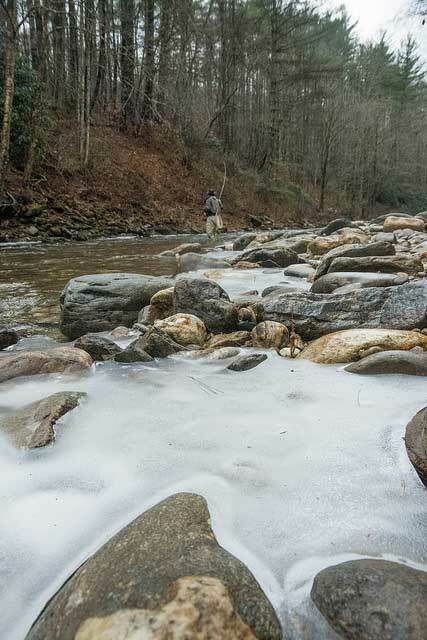 With that first lungful of spring air, thoughts of wintertime trout streams are banished. Spring steelhead feels skipped-over. The mid-sixties heat and sun on my face resonates like a war cry. It roars of double-hauls and a good-sized fly and a wire bite guard. But where? Winter is dying but not yet dead. The lakes and rivers are still mostly lidded by slushy honeycomb ice. I search my archives and aerial photos for wintertime open-water spots. Between the Great Lakes and the many major shipping rivers, there are many small pockets of open water, warmed by the fires of industry. Dams, bridges, power plants. Open water. I load a rod and my waders into the truck. The first thing you notice about these places is the smell. That springtime fresh air that brought you here is hidden beneath an acrid plastic industrial odor. The next thing you notice are the fish. There’s always some kind of activity in the warm-water magnet. Not always gamefish, but something. Today they are gizzard shad, a dubiously-native fish to this watershed. The channel I’m walking along returns coal-fire-warmed water to a river and today literally teems with shad as they cycle up and down the bank, splashing and swirling. The writhing black mass with flashes of silver reminds me of the minnow tank at the bait shop. I try to find the edge of the school and make my a few casts and almost right away the hook grabs–a shad, just behind its characteristic dorsal fin. It is very slimy and fluoresces pearl blue in the sun and it takes more than a moment to recover itself on the surface after I shake it loose. Surely there must be predator fish eating these shad. On the ice a quarter mile away are a hundred seagulls and five bald eagles doing just that. My fly is a double Great Lakes Deceiver and it matches the baitfish perfectly, both in size and color. Too perfectly, probably. For a while I keep casting but I snag a shad about every third cast and am forced to give up. These winter warm-water hotspots are not always urban but they are always industrial, and the fish they attract are usually a grab-bag of natives and invasives, often scarred and ugly, often large. The experience overall is quite different than the pristine backcountry natural experience an angler might prefer, were it not February. It’s like being a restaurant connoisseur, a real foodie, who wakes up ravenous after a three-month nap only to find that the only open restaurant is Applebee’s. It’ll have to do, though the ambiance and the food just aren’t the same. In its defense the portions are often huge and they have a rotating menu. No matter what, it beats starving. My introduction to this industrial byproduct fishing was on a day much like this one–T-shirt warm–in early March a few years back, on a Lake Michigan shoreline where a coal-fired power plant dumps heated water into a channel at the mouth of a major river. To my left was the plant and its smokestacks and barbed wire and to my right was open water to the horizon and miles of deserted beach. It was a place of contradiction and in two hours of blind-casting into a winter wind and a two-foot surf, I caught three truly giant smallmouth bass. On other days and in other places I’ve caught carp, catfish, largemouth bass, walleyes, northern pike, and freshwater drum. It’s usually not sight fishing, though sometimes it is, and it’s usually not scenic, though sometimes it is. It’s never predictable and never hits that transcendent wild-fish-in-a-wild-place sweet spot. But it usually does, more generally, hit the spot. A week later I’m back, and so too is winter. Steaming discharge water laps at a fresh rime of frost on the beach rocks and the shad are gone. The sky is grey and a cold wind, winter’s last gasp, blows tears from the corners of my eyes. But almost right away my fly stops hard, and I can feel the headshakes of an angry predator fish which proves to be a northern pike. Maybe a five-pounder. I set my rod on the shelf-ice and slide my fingers underneath her chin gillplate. She has the silvery cleanness of a big-water fish and a distended shad-shaped belly. The hooks are barbless–I’ve learned my lesson about that in this wind–and they come out easy, but I have to rip the bucktail and Flashabou from her Velcro teeth. As I do her eye seems to look past me at the cooling stacks and transmission wires. She can’t know how out of place they are here. This shoreline should be willows and oaks and pines but hasn’t been for a hundred years or more. She doesn’t know this. She is wild, if the place isn’t. I only last an hour before my fingers and toes are too numb to continue. But my arms feel good and tired from double-hauling in the wind and it feels good to be wielding a fly rod again. Compared to a tip-up, this eight-weight is a more elegant weapon for a more civilized age. Spring, after all, is coming.